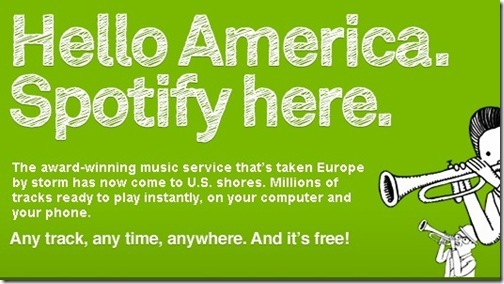 You are here: Home » How to Get a Free US Spotify Invite Code? 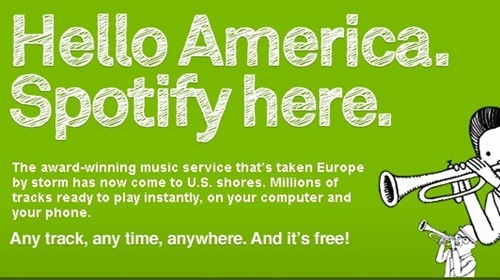 Spotify just launched in the US this morning. If you didn’t know or haven’t heard about Spotify, that should explain what the service is all about. Spotify so far has been available only in Europe and it has finally landed in the US. You can request an invite for the Spotify free account or sign up for one of their premium $5/mo or $10/mo plans and get access to it right now. At the moment, that is the only way to get a free Spotify account. However, Spotify is available to anyone who wants to try the service by paying either $5/month for an ad-free desktop version. With the $4.99/mont plan you only get access on your desktop with an ad free ex experience. You can also pay $9.99/month and get mobile access as well as offline playlists. If you buy music a lot from iTunes or elsewhere, Spotify could work out cheaper since they seem to have pretty much everything on the planet in their streaming service. How to Get Free Spotify Invite? However there is a way to get a free Spotify invite right now. But not easily. Klout is a free service which measures your social networking engagement and your ‘social media clout’. Spotify has given them a few invites to free Spotify account. So, sign into Klout with your Twitter or Facebook login and see if you have enough Klout to win a free Spotify account. I will update this post as soon as I find more ways to get a free Spotify account invite. I wish they did something like the Google+ invite where one person could invite their friends. If any of my readers have spare Spotify invitation code, please do send me one. Once you get an invite, there is a Spotify download for desktop as well as a Spotify iPhone app. First one to PM me on Twitter gets an invite. Can you post another one? can i get one please. Make it 2! I would like one. Please! !